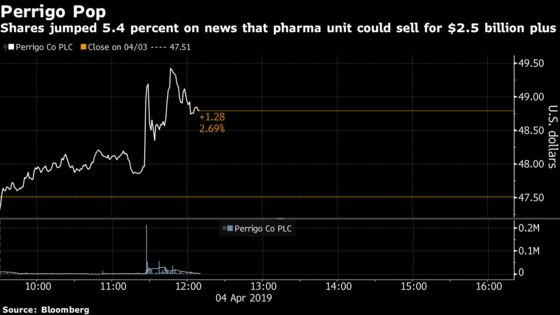 (Bloomberg) -- Apollo Global Management LLC and CVC Capital Partners are among bidders vying for Perrigo Co.’s prescription pharmaceuticals arm, according to people with the matter. Carlyle Group LP, Altaris Capital Partners LLC and Cerberus Capital Management have also advanced to the next round of bidding for Perrigo’s Generic Rx unit, said the people, who asked to not be identified because the matter is private. The business could fetch slightly more than $2.5 billion, one of the people said. The private equity firms are all bidding for the division through affiliates, the people said. Representatives for Apollo, CVC, Carlyle, Cerberus and Perrigo declined to comment. Representatives for Altaris didn’t respond to requests for comment. Perrigo rose as much as 5.4 percent to $50.09 in New York on Thursday. Shares were up 2.2 percent to $48.51 at 11:31 a.m. giving the Dublin-based company a market value of about $6.6 billion. Perrigo is seeking to sell or spin off the prescription arm to better focus on its consumer businesses, it said in a statement in August. It also said it believes another owner can get more value from division’s portfolio of creams, foams, gels and liquids. "We will refocus the portfolio in the consumer business and it is still our plan to sell or spin RX," Perrigo Chief Executive Officer Murray Kessler said during a presentation in January at a health care conference held by JPMorgan Chase & Co. "I’d say we prioritize sale over spin, but we’ll see."